Here is an ink drawing of a cat that is up for adoption with the ASPCA. A local nonprofit asked selected artists to create a portrait of an animal available for adoption. 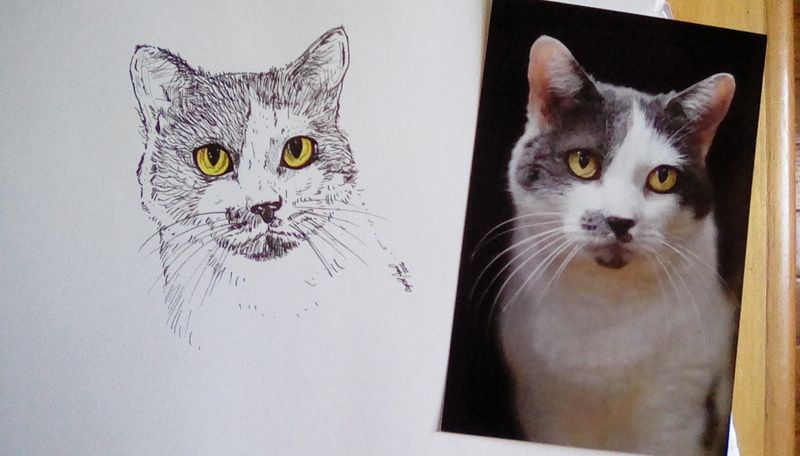 Whomever adopts this gray and white feline will also get a portrait of the same animal. Here I drew the cat in ink, using Micron black pen. I used Prismacolor colored pencils to add color to the eyes. I may add a bit more ink for detail,but overall this piece is done and it needs to get to the gallery to be in display with the other works. Enjoy!